The compact field guide to photography with your Canon EOS system. Learn how your EOS camera works, key photography terms and principles, and the key camera features that will improve your photography. Photography is full of jargon which can be a distraction when you’re trying to react to an opportunity. Then there’s all the buttons, dials, menu settings and more. Have this Pocketbook on-hand to reassure you of wide and narrow aperture settings, how Auto ISO behaves in the different shooting modes, what a stop is, the shutter speeds needed for different action subjects, the basics of focusing and so much more. Nina Bailey has once again condensed her knowledge and experience from teaching photographers into one concise and highly portable guide. 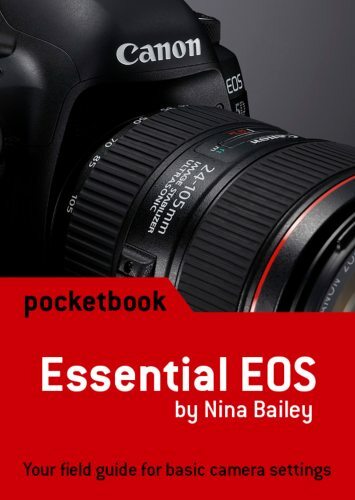 If you struggle with the basics of photography or find yourself in need of an occasional reminder about your Canon camera settings, this is the book for you. Relevant to all Canon EOS cameras – DSLR and Mirrorless. Excellent little book with lots of information,handy size to put in your camera bag. Great little book full of information just what you need in your kit bag. I also purchased one of these to go with my Eos camera. Excellent little pocket guide, great to keep in your kit bag. A lovely little book, very informative.